Warning! Do not read this review while hungry. You’re about to read many words about burgers, which will make you hungry to play Burger Up, but also to go out and eat at that grass-fed beef only burger place across town. I can’t help you with your burger cravings, but I can tell you about the oddest burger restaurant in the universe, which is the one where Burger Up players are employed as burger chefs. Just imagine what happens when someone orders a burger there. The order goes up on the kitchen counter in the form of a top bun card, because top buns describe the kind of burger they’re supposed to crown: Really big and with at least three patties (the Iron Giant), vegetarian with BBQ sauce (the Vegetarian Cowboy), or dozens of other variants. Now all the burger chefs try to make the same burger, and they even compete for the ingredients. The first player to complete the burger as ordered grabs the top bun, shoves it on top of his burger, rams a skewer through it so the whole tower can’t fall sideways off the plate, and off it goes to the hungry customer. I don’t object to this way of making burgers, but someone should yell WHO’S CUISINE REIGNS SUPREME at the beginning. Or maybe the slowest chef is fired every week. Okay, it’s unfair to make fun of Burger Up for the silly plot. Most other games that make you compete in traditionally non-competitive activities (like painting or quilting) could be mocked the same way. What is important is how it works as a game. For this one, the core of how it works are the rules for puzzling a burger together. It wouldn’t be much of a game if you could just stack them up any way you wanted, would it? You build burgers from ingredient cards. 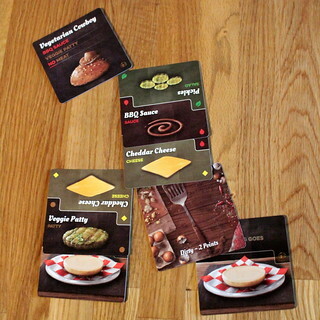 Each card has two ingredients, you have to turn it to add one or the other to your burger. Each ingredient also shows the type of ingredient that can go on top of it. If the card says that a condiment must come next, and you have none, then the only thing you can put on your burger is a top bun, if you meet all its conditions, or one of the rare middle buns that act as jokers to meet the ingredient requirements. Lets look back at the Vegetarian Cowboy from before. The top bun demands BBQ Sauce, a Veggie Patty and No Meat. The order comes in, and you rejoice because you have both, so you slap a Veggie Patty onto one of your two bottom buns. But then you realize in horror that this Veggie Patty must be followed by a cheese, not a condiment. That’s not a huge problem, extra ingredients are allowed – unless it’s meat on this burger – and even increase the price the burger will fetch. You even have a cheese. Brie is a weird choice here, but it’s a cheese. But on top of your Brie you now need a salad ingredient, like the Tomato you still have. And that Tomato, finally, can be followed by a condiment, but your BBQ Sauce will have to wait until next round because you can only play three cards per turn. You’ll just have to hope that no one else completes this burger before you can. Once you know how to stack that burger, Burger Up is easy enough to play. At the start of your turn, there will be three top buns on the table with a variable amount of money, there will be three ingredient cards in the market and you’ll have four ingredient cards in your hand. Your turn has four simple steps. First, you go to the Market and buy all the ingredient cards you want for $1 each. Then you place up to three ingredient cards on your two growing sandwiches. If one of them meets all the requirements for a top bun card on the table now, you may grab that card, top your sandwich and send it out to be served. Then you refill the Order Area to three top buns, the Market to three ingredients and your hand to four cards. You can only take one top bun per turn, but on the plus side you get paid for that one burger. Each top bun starts with one coin on it, and another one is added every time another top bun is taken, making orders more valuable the longer they are around. When you complete a burger, you get that money, plus some more money for the burger’s size category (Sandwich, Gourmet, Tower or COOOOLOOOOSSAAAAAAL), plus $1 for every ingredient card with the friendly, little word “perfect”. Instead of taking $10 for a Colossal burger, you can also choose once per game to upgrade your burger station and be able to play four ingredients per turn from then on. The money you make from burgers is a large part of winning the game, because each Dollar is worth a point when the game ends. You get bonus points for having completed the most burgers, and you get a few more bonus points if you didn’t use your Spatula, a handy tool that can twice per game move a partial burger to your other burger or to the trash. Those bonus points often make the deciding difference in the end, but the bulk of your points is money. A lot in Burger Up depends on having ingredients that go with the top buns on display, either in your hand or ready in the market, so there’s a significant amount of luck involved. That’s not to say that tactical decisions and hand management aren’t important in Burger Up, but when every burger needs a Fried Egg and you just don’t draw one, then no amount of managing your hand will help you. It’s rare that you get that heavily frustrated, but it does happen. For the most part, though, bad luck strikes everyone equally, and then it’s a lot of fun to play Burger Up. 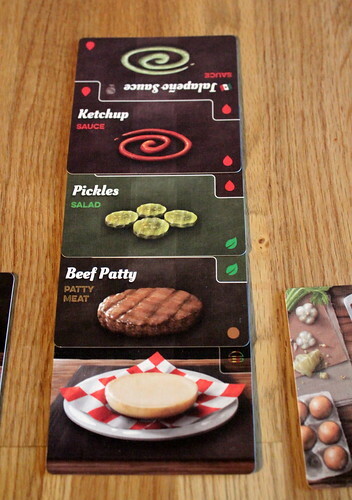 The ingredient cards dictating what can come next make assembling a burger not exactly difficult, but the right level of challenging for a quick game to have fun with friends. With a bit of hand management, a bit of tactical planning, a bit of interaction with the competition for top buns and a bit of good, old schadenfreude when everyone else gets Fried Eggs while you lament the apparent extinction of the chicken fruit. It’s a good combination for a lighter game. And don’t underestimate another big point of appeal: you will be creating very tasty burgers. Sure, some are just over the top, like the Meat-A-Saurus Rex that needs a minimum of four toppings, two of which must be meat and none of which may be salad. But can you honestly say that you wouldn’t eat a Hawaiian Sunrise (4+ ingredients, must include Fried Egg and Pineapple) right now? Because I would. Oh yes, I would. The appetizing art on the cards does the rest to make me end every game of Burger Up hungry. Now, if you’ll excuse me, I’ll go fry an egg and some pineapple rings, and then I’ll play some more Burger Up, because making burgers while eating burgers does sound pretty good right now.